Your Family, Agile, and You: Size matters, and comparing sizes matters even more. Size matters, and comparing sizes matters even more. What will be the right size of a task so it will be easier to bring it into execution and action? How can we size the effort needed to get it done? And how do we know what is right for us compared to someone else performing the same task? Kids (and adults) often mistaken their ability to get things done while getting right into action when encountering a problem or a task. Sometimes, they even are avoiding getting into action due to the fact that the task seems to be too big or too complicated to execute… I sometimes see kids getting to much homework that just looking on the size of their “homework” tasks can be frightening. Who wouldn’t prefer not to play outside instead of dealing with this giant homework assignment? Sizing those tasks has a lot to do with our ability to get them done. It allows us to better scope our attention, better control our activities related to a specific task and gain confident while getting those tasks done. Much has been written concerning the efforts estimation of a task and its relation to ease our ability to execute it. As is commonly assumed (no matter if it is false or not) that when we know how long it will take to complete a task or what the effort entails it will be easier for us to understand when a group of tasks due to complete. It is often assumed the same assumption about the size of a task or a problem. I say, When we know what’s the right size of a task according to our subjective ability to execute it, it will be easier to estimate a group of tasks and accordingly our ability to get them done. There are many methods that can be applied to understand a task size so it won’t be too big to deal with or too small to even consider doing it and accordingly to get it done. If so, how do we balance the size of our tasks for ourselves or for a chield? The answer, of course. It depends. Here are some tips which will help us better understand the subjective size of the task according to subjective personal ability . One. Create your task list and make sure it is visible and apparent. Visibility makes things happen. The Task list should not stay in your head put it on the board. So after seeing it, it gets easier to organize things and make decisions and certainly easier to understand what takes more time or less time comparing to other task. At this stage all we want to achieve is the ability to visualize tasks in deferent sizes. It is still one big wish lists of stuff we need to do or to achieve. 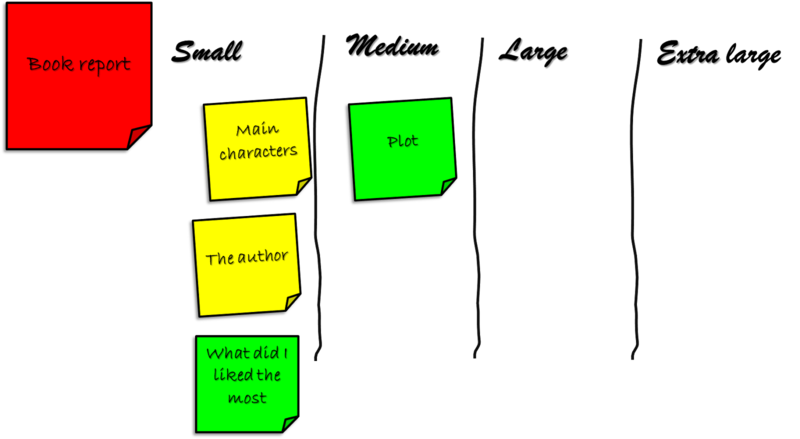 For better Visibility, create three columns on the board and place each task under the appropriate column, or perhaps even give a different color for each size. The main goal at this stage is that you will be able to see the differences between tasks sizes. Remember when you were a child, places seemed bigger and greater probably more than they are today? This is how a child sees tasks. Much larger than they appear to us. Things that seem small and simple to us can be perceived as very large and complicated to children. Often because they lack information or guidance, or just because that's how it is in their eyes. And yes, listening and asking questions to understand the enormity of the task in the eyes of the child is the next step we need to take. What is a small task ? What is a big task ? What makes it large? Four. 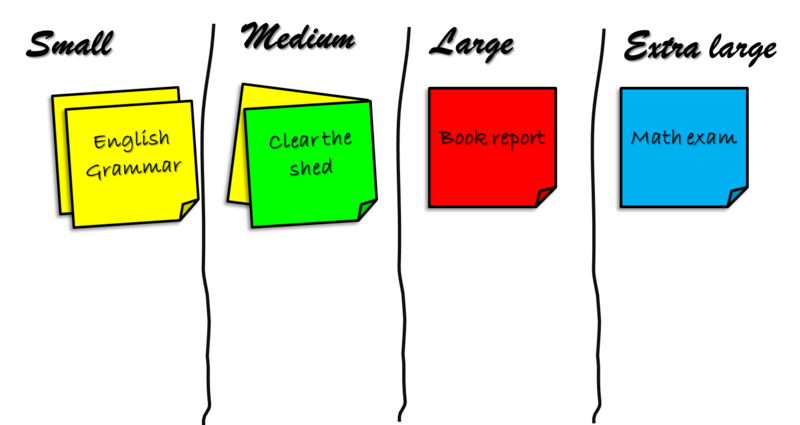 Once the most important tasks are on the task board, take the large tasks and split them into smaller ones. Remember only small or medium sized tasks will be executed – so make sure to split those tasks to an executable ones. Small task is one that can be completed in a relatively short period of time, defiantly not in a week or a day, and obviously appropriate for a child time frame. Five. While executing the tasks - stick to tasks that are small or medium-sized and arrange your tasks in order of action. Six. Select one task at a time and start to perform. 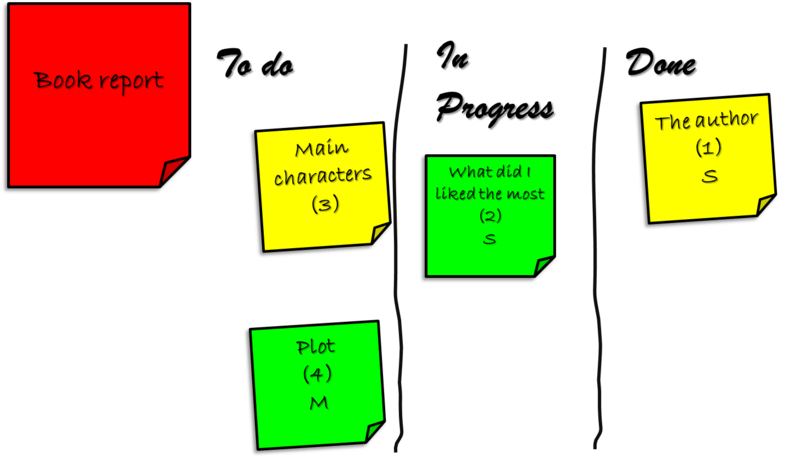 Make sure to visualize your path to execution as well (To do – Doing – Done) on the task board. Seven. When a task is too large to execute, do not be afraid to split I in to smaller ones. Eight. Not every task must be sized. In fact, most tasks do not required sizing. For example, let's say, the child has only two days to study for his next exam, then we can start by splitting the tasks in a very rough manner such as What to be studied today and what to be studied tomorrow. We can then discuss any task and understand it if it belongs to the first or second day and size only those tasks that seems too big to handle. In short, let’s try to keep things simple. 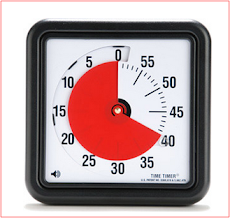 Sizing a task should be "just enough" so we can get started. We Do not need to dig too much in to the details of a tasks so we can assess accurately hours and minutes that it will take us to execute it. Three sizes of 'small', 'medium' and 'large' can suffice. Nine. What will truly help get things done and understand the right size of a task for a child is parental involvement. Conversation. Children love that we talk to them, relate to what they need to do, help them understand things. So while this simple technique will help them better understand the task and may even reduce anxiety or focuses on what matters, what will make it really happen is the conversation with us, their parents. Ten. And do not forget to enjoy the ride.